I started watching a Netflix original documentary, Chef's Table. In the opening segment of the first episode, Massimo Bottura, owner chef Osteria Francescana, talks about creating a recipe for a risotto cacio e pepe as a means to help save the Parmigiano Reggiano business after earthquakes hit the Emilia-Romagna region of Italy in 2012. 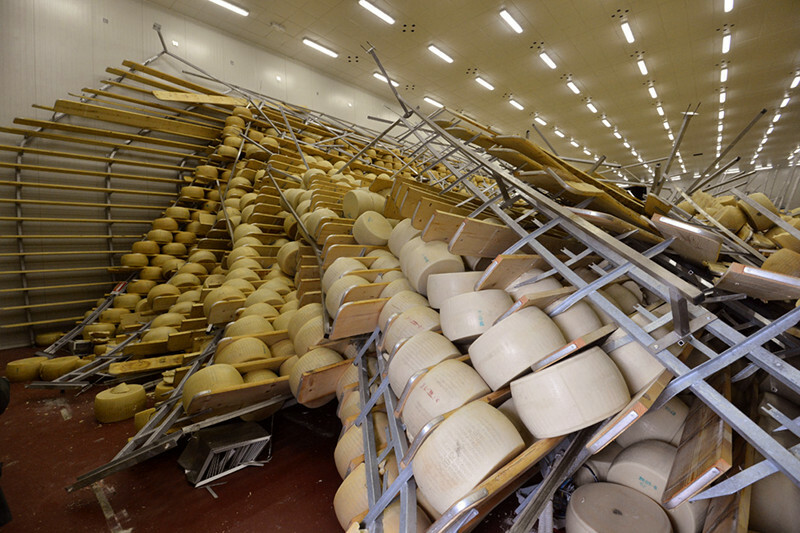 The earthquakes toppled the racks and racks of aging Parmigiano in the region resulting in 360,000 damaged wheels. Massimo talked with the consortium and devised a dinner where people across the world would make risotto cacio e pepe and and share in a virtual dinner together. He says the recipe saved the Parmigiano makers and kept their businesses alive. I immediately fell for the risotto, how rich and awesome it must taste. Off I went to buy my 3 pounds of Parmigiano Reggiano. Now the risotto itself is not too difficult to make. The amount of Parmigiano required seems a bit obscene. I searched the internet and found many different recipes all apparently directly from Massimo Bottura. The Parmigiano to water ratios varied greatly. What seems to start out as a 3 pounds of cheese cooked with 16 cups of water, gets mowed down to 1 pound of cheese with 16 cups of water. Cost of a pound of Parmigiano ranges about $17.00 to $20.00 a pound in Seattle. Sometimes you can get it on sale, but either way, 3 pounds of it to make risotto is not cheap, especially when you consider you are throwing the solids away after you make the broth. Now that I have my 3 pounds of cheese, I debated how to proceed. In the end, I decided to cut the recipe down, make less risotto as I'm guessing it will be so decadent that a little will go a long way, and err on the side of a richer broth because you can always dilute, but you can't add more cheese after the broth is made. I am sad to use my big hunk of cheese because it makes the kitchen smell so good and the kids are drawn to its girth, asking "what are you doing with that cheese?" whenever they walk by. Start a day ahead by making the Parmigiano broth. Combine the grated cheese and water in a large saucepan over medium heat. Heat until the cheese becomes stringy and the water temp is about 190 degrees f. Stir periodically. Let cool to room temp and repeat this heating process once more, until water temp is about 175 degrees f. Let cool and refrigerate overnight. The next day, the broth should have separated into 3 parts; the cream on top, the broth in the middle and the solids on the bottom. Skim the cream off the top and place into a separate container. Strain the broth and discard the solid. This yielded 5 cups broth and ¾ cup cream. To make the risotto, heat the broth in a saucepan over medium heat. Once it comes to a light simmer, turn heat off and keep warm. Heat the olive in a medium pan over medium heat. Add the rice and cook, toasting it for a couple of minutes. Add the broth about a half cup at a time. Stir the rice once each time and simmer until the liquid is almost fully evaporated between broth additions. If you find that the broth is too rich, you can always just add some water with the broth. When the rice is ready about 25-30 minutes, and is a little al denté, remove from the heat and stir in the Parmigiano cream. Serve immediately on a warmed plate and finish by sprinkling a little of the ground peppers on top. I am sad to report my family was not impressed. They said it was too cheesy. It was very cheesy, but I liked it, but love, no. Maybe I over cheesed it. The pan fried quail I served along side was the bigger hit. Hmmm... I now have plenty of Parmigiano Reggiano to get through.